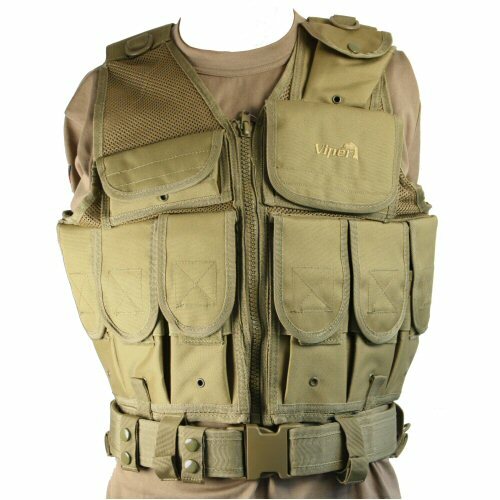 The Tan Viper tactical vest is also known as the LA special forces vest and is a much improved model over the earlier Viper vests. Made from super-thick PU coated 600D Nylon, the vest features water resistant and dust resistant pockets on the body. These are almost comparable to fully lined pouches in terms of stabilty due to the stiffness given by the thick PU coating, which retains its flex and scratch resistance despite its thickness. The pouches and pockets are fully trimmed to increase durability of pocket openings and other stress points. The pocket panels are mounted on breathable nylon mesh which aids ventilation. The pockets available are: Shotgun shell holder on right chest, FFD or compass pouch on upper left chest, large horizontal utility pouch on left chest, six pleat pockets with elastic reinforcement (three per side), internal pocket on left and right, mesh pocket on rear for hydration bladder. 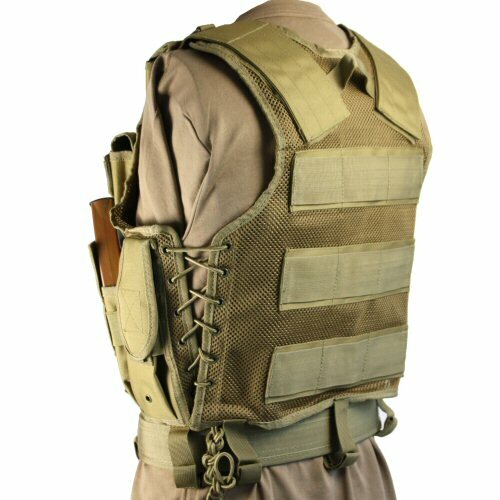 In addition, the vest has D-ring on left and right chest for attachment of comms or hydration gear, carry handle on upper back, 50mm wide webbing sewn across rear for addition of belt pouches or MOLLE pouches, belt loops at bottom of the vest, and left and right 25mm loop at base of vest. 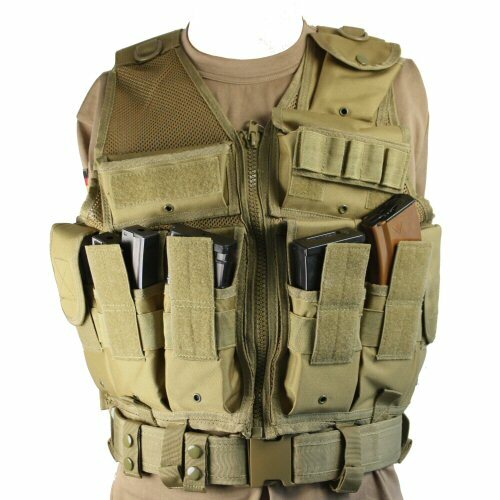 The vest includes a 2in duty belt with triple secured quick release buckle. The vest opens centrally with a chunky zipper. Vest adjustment is over the shoulder on both shoulders and along the sides with lace and toggle system. 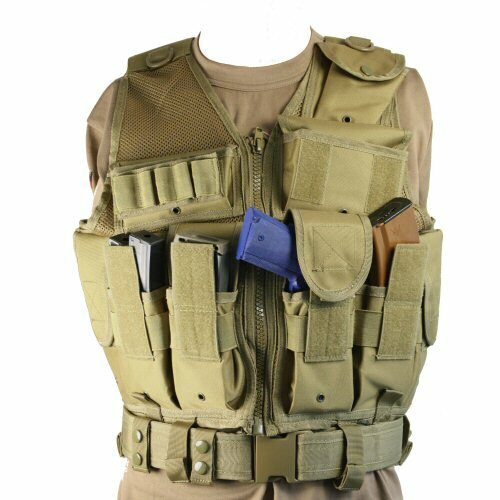 The vest is comes with shotgun shell holder inside the shotgun shell pouch and a triple loop elastic in large utility pocket. The pleat pockets are shown below with a variety of magazine types: M16/M4/AR15, AK47, VZ58, G36, MP5. We also inserted a pistol sample into the pocket for testing the pocket suitability as an impromptu holster and this was found to be very stable. A good starter vest at a reasonable price with highly improved construction and materials. The vest with the shotgun cartridge retainer shown on the front of the pocket it is stored in. Magazines and accessories modeled are: 2x MP5 30 round magazines, AR15 magazine, Colt 1911 blue pistol, AK47 magazine. The vest modelling 2x MP5 30 round magazines, VZ 5.56 magazine, G36 magazine and AK47 magazine. The rear and side of the vest showing the shoulder adjustment, carry handle, lace torso for side to side adjustment and belt loops for the tactical belt which is included.